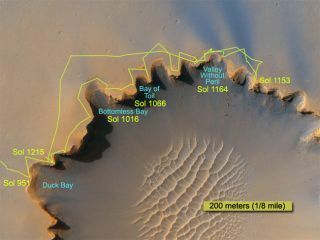 The route followed by NASA's Mars Exploration Rover Opportunity during its exploration partway around the rim of Victoria Crater is marked on this map. The rover first reached the edge of the crater on it's 951st Martian day, or Sept. 26, 2006. This map shows travels through June 24, 2007. Updated at 2:31 p.m. ET. The MarsExploration Rover (MER) "Opportunity" will perform a risky descentinto the red planet's giant Victoria Crater early next month. Theannouncement was delivered during a NASA teleconference today, and came aftermonths of debate about whether or not to proceed. Officials said the decisionhas been difficult to make because some scientists think the crater may becomethe aging rover's final restingplace. Alan Stern,NASA's associate administrator of the Science Mission Directorate in Washington, gave the go-ahead during the conference. "We'vemade a decision to authorize the rover to descend down into VictoriaCrater," he said, noting that the move is not without risks--if itgoes inside the large hole in Mars' crust, it may malfunction or not be able toclimb out. "But the science could occupy us not just for days or weeks,but for months. This is why I've authorized the rover to go into thecrater." Opportunity iscurrently perched on "DuckBay," an alcove on the rim of the crater from which it will descend.Scientists have deemed the site the gentlest entry point to the 800-meter-wide(2,600-foot-wide) crater. The rover isset to make its descent early next month. "Perhaps the 7th or 9th ofJuly," said John Callas, MER project manager at NASA's Jet PropulsionLaboratory in Pasadena, California. He noted that the team will first see ifthe rover can make the trip with a short "toe-dip" into Duck Bay. ?We chose ourentry point solely on the basis of safety,? said Steve Squyres, principalscientist of the Mars Exploration Rover team at Cornell University in Ithaca, New York. Squyres explained that moving the rover only a few feet down the slope andbacking it out should reveal any unpleasant surprises such as slips or slides. In addition toslippery terrain, the Mars scientists fully accept the risk of wheel failure orother malfunction once in the crater. ?We believe we can get in and explore andget out safely, but if we were to have a wheel failure on Opportunity thatwould make getting out very problematic,? Squyres said. During thedescent into Victoria Crater, however, the scientists expect to stay busy. ?It?s muchfarther away from our previous craters than any place we?ve been,? Squyres said. ?And this thing is a hell of a lot deeper than any other crater we?ve looked atso far. This provides us access to a much longer span of Mars? geologichistory.? But perhapsthe most important aspect of the crater, Squyres said, is that it?s extremely old--possiblybillions of years. Instead of a fresh impact with chaotic jumbles of rock, thecrater has eroded to its current form and has exposed a clean spread of intact bedrock. The roverteam?s first objective with Opportunity is to scope out a bright band of rock in un upper portion of the crater. ?It?sdifferent from everything else around it,? Squyres said. ?This is the layerthat was in contact with the Martian surface at the time of impact, so it mayhave preserved information about ? the ancient Martian environment.? The roversSpirit and Opportunity have been exploringthe Red Planet since January of 2004 and were expected to last just 90 days onthe dusty surface. Defying the odds, they have both been in operation for morethan 12 times their expected mission length--but not without event. Spirit's rightfront wheel stopped moving in March of 2006, but has since proven an effectivesoil-digging instrument. In May of this year, it turned up a powdery whitesubstance discovered to be 90 percent pure silica. Scientists think itspresence beneath the surface is indicative of a watery past on Mars. In addition to looking out for mechanical troubles, team members are closely watching a massive dust storm to the south of Opportunity. "We are tracking this thing daily," Squyres said. "It's a risk to us, just as driving it down into a crater is a risk to us. The dust levels are among the highest we've seen so far." Assuming a safe journey and good weather, Squyres thinks Opportunity will make exciting discoveries while in thecrater, as well as when it leaves to investigate the cobble-strewn plains inthe area. ?We?veblown by a bunch of these stones in a hurry to get to crater,? he said, andhave looked at ?only a handful? of them. From meteorites to debris rocketedfrom distant impact sites, Squyres said investigating the rock-strewn plainswill be Opportunity?s next big mission. ?Nature hasdelivered to us, in the form of these cobbles, exotic rocks from places wecan?t sample,? he said. In addition, the team hopes to look for more evidenceof surface water, which they think they discovered around Erebus crater.